I am currently evaluating Server 2012, looking at all the new improvements it has to offer and have been playing with it in a test environment over the past week and am slowly gaining my bearings with regards to navigation and getting around in the new OS. This newest Microsoft release has definitely been an overhaul and it takes a certain amount of adjustment in getting used to. I would like to highlight a few useful commands that will tremendously decrease the burden and learning curve when you look at this new OS and adjust to its differences. 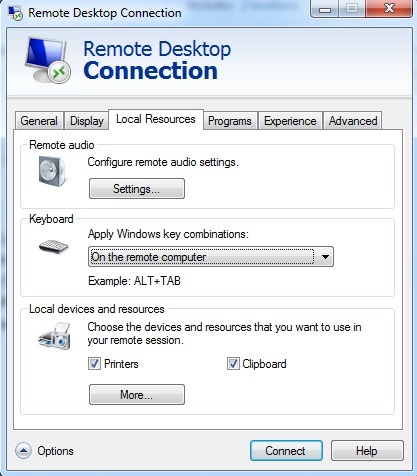 I should mention that if you are managing these servers through RDP you will need to change the default keyboard behavior to “On the Remote Computer” on the keyboard resource screen. This is the first and most obvious shortcut I would like to mention. It is probably the most important though as well and is also much easier in my opinion to access then placing your cursor in the bottom left corner. This will pull up the new and improved Start menu (though some would disagree). From here you can browse basic tasks or start typing to pull up the built in Search menu, which is actually pretty slick. The search feature along with the new Server Manager will quickly become your best friend in Server 2012. Opens the new Windows “Charm” bar, for those of you that are still new to 2012 like I am, this is the sidebar in the right if you drag your mouse the top right corner. It is so much easier to just use the keyboard shortcut here for the same reason that the Win key is for opening the Start menu. It is just annoying not to use the keyboard shortcut. This one is very handy once you get used to using keyboard shortcuts for everything. It essentially pulls up a list of some of the most common menus in the bottom left corner. It becomes very useful when you are doing a lot of maintenance on numerous 2012 servers. This is another great time saver. It has been around for awhile but it has become so much more useful in 2012 because of the change in the GUI. So if you’re like me and put a lot of stuff on the desktop then this is super helpful, especially if you have a bunch of windows open and your desktop is seemingly buried. To put things back to where they were then just punch in the key combo to restore your work space. This will pull open the search bar immediately which will skip the initial Start Menu screen, which isn’t always super useful in the first place. Even with just these few shortcuts you will vastly improve your user experience in Server 2012, at least I did. Getting familiar with the newest version of Windows quickly will be an important step for administrators because the latest version offers so many improvements and useful features. It would be a foolish mistake not to invest in learning this GUI just because it is different and isn’t what people are used to.